Capitalism looks different because of what Jobs’s company achieved. His company challenges both lazy market orthodoxies and idealistic anti-capitalist critiques. In general terms it is true that all these challenges have found voice and expression in our culture elsewhere. But with Jobs they were given a clearer, louder expression, backed up by the incontrovertible evidence his life and company produced. The world may well have been different without Jobs: not so far forward as we are, less beautiful, more in tune with the lowest common denominator. If we found ourselves in that world right now, of course, we would recognise it. But we might not love it quite so much. Baggini seems to think that Apple’s resistance to the open-source movement somehow proved to the world that quality products demand a premium price, rather than simply showing that a business run along such lines can be successful – and from this somehow draws the conclusion that non-hierarchial modes of production don’t work. At the same time he argues that Jobs’s visionary leadership struck a blow for the Great Man theory against neoliberal models of market forces, because while without him we would still have had mp3 players and tablet computers, they might not have had so much brushed aluminium and those Nice Friendly Rounded Edges we demand in all our consumer products these days. I mean, can you imagine if instead of an iPod everyone had a Zune? What a vale of tears this world would be. This is a shoddily shallow analysis, one blinded by its narrow focus on its phenomenological qualities of capitalism rather than the relations that constitute its actual substance. Steve Jobs didn’t change capitalism, he stuck to its guidebook with unwavering diligence. Style over substance, branding over utility, outsourced production, continually intensifying rate of exploitation, the relentless pursuit of new markets and new profits, all washed down with a syrupy semi-mystical techno-guruism. Henry Ford revolutionised the means of production and the superstructural society that emerges from it. Charging high prices and insisting on proprietary rights does not constitute a restructuring of our economic system. Jobs was an exemplar of the cultural dimensions of late capitalism, but little else. 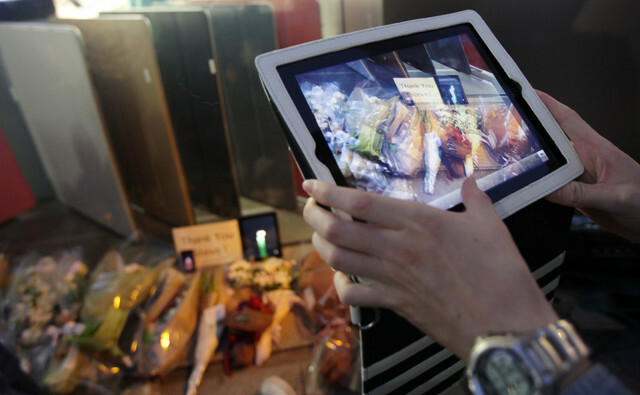 Across the world, dedicated iVangelicals are leaving flowers outside Apple stores. It’s appropriate, in a way: buried in this gesture is the recognition that Steve Jobs was not so much a man as a projection thrown up by his products. This is commodity fetishism taken to its logical conclusion – products are imbued with so much importance that they take possession of their inventor; not content with mere reification, they eat him from the inside out. Beautifully put – I love your blog!